When my son was a preschooler, he loved to carry around little action figures he called his “guys”. The memory of his chubby warm hand with a death grip on a “guy” just makes me smile. 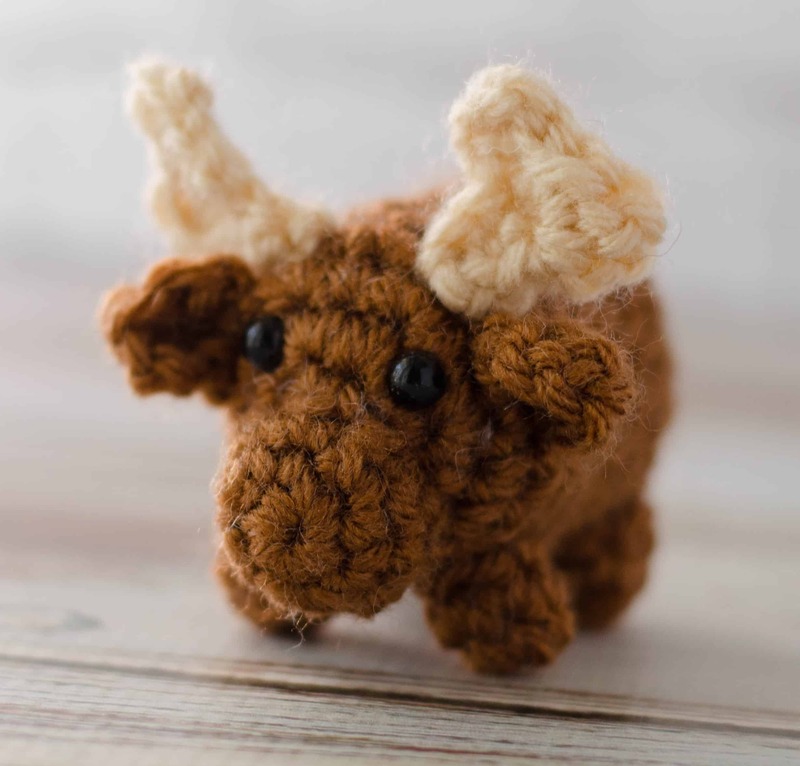 Today, I’d like you to meet this Crochet Moose! 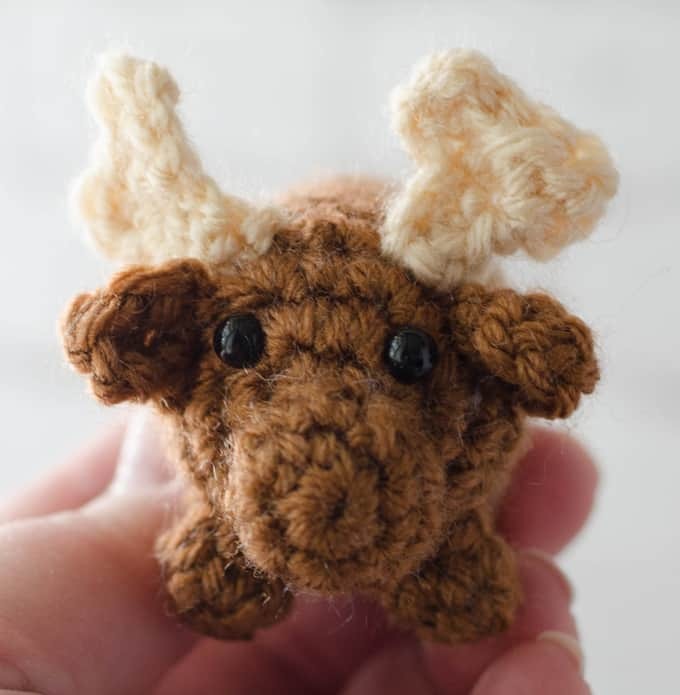 The crochet moose is the 2nd in a series I’m calling Bitty Bumbles. Bitty Bumbles are small amigurumi (or stuffed toys). In fact, the Bitty Bumbles remind me a bit of the “guys” of my son’s childhood. The “guys” and my little guy had all kinds of adventures together. 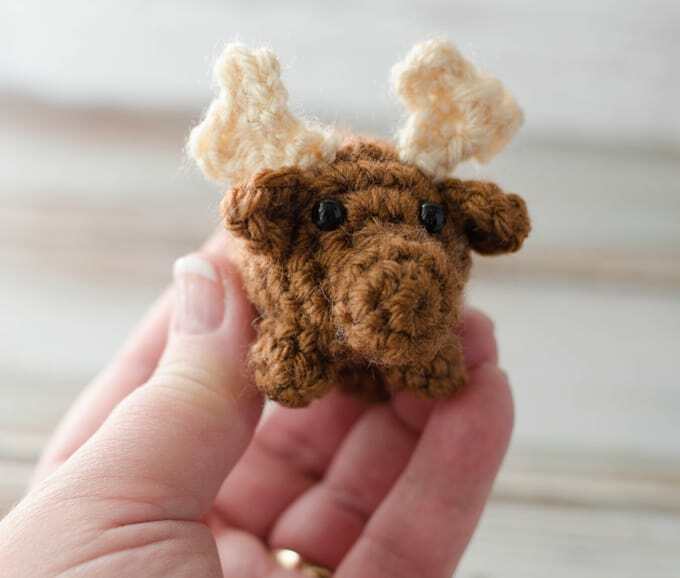 And maybe a Bitty Bumble like this cute moose could be a guy for your little one. Of course I think everyone might like a Bitty Bumble for herself. I see them scattered in my office at work. In front of my TV at home. They might even be just the thing to tuck into a stocking at Christmas time. They are little. Cute. And just fun. Did you miss the first Bitty Bumble? Click here to read all about it! For other great products I recommend, be sure to check out my special store on Amazon here! To make the decreases less noticeable, use the invisible decrease method. R1: 6 sc into ring (6 sts). Take time out to insert safety eyes. The safety eyes go between rounds 2 & 3. Refer to photo for placement. Stuff and continue stuffing as you finish up the body. R14: sc next 2 st together (6). Weave opening closed. Fasten off and weave in end. R2: *sc in next st, 2sc in next st, repeat from * around (9 st). R3: sc around. Fasten off. For a nice finish, use the (optional) Invisible Seamless Join technique. Stuff with a tiny bit of stuffing. Position muzzle below eyes and sew onto lower part of face. R1: sc in 2nd ch from hook, dc in next ch, ch 2, sl st to last ch. Fasten off leaving a long strand for sewing. Position ears so that the starting chain is resting against head and sew an ear on each side of the head. R2: sl st in next 2 st, in next stitch work: (sc, dc, ch2, sl st). Fasten off. Sew antlers on head in between ears. With brown, make a magic ring. R2: sc in ea st around (6 st). For a nice finish, use the Invisible Seamless Join technique. Leave a long strand for sewing. Position front legs between rows 5-7 and back legs between rows 10-12 on bottom of moose (or wherever looks best to you) and sew down. Note: Legs are not stuffed. I love seeing your finished projects! 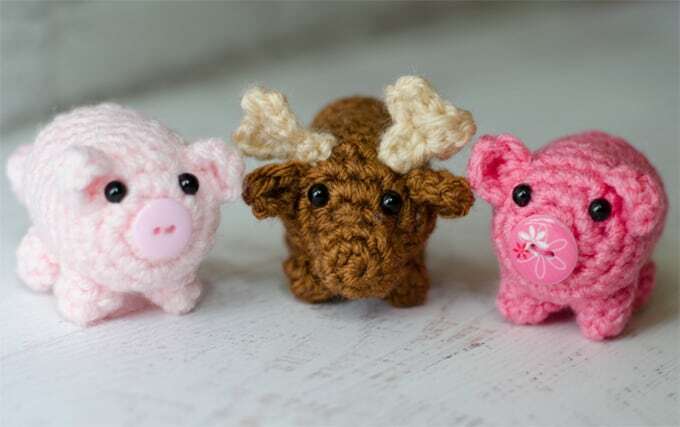 If you enjoyed making the Crochet Moose #BIttyBumble, I’d love to see yours on Instagram, be sure to tag me @crochet365knittoo. If you are on Facebook, stop over to the Crochet 365 Knit Too Facebook page and share a photo! I’d love to see your work! Written pattern copyright Cheryl Bennett 2018, all rights reserved. Please do not reprint or repost this pattern. 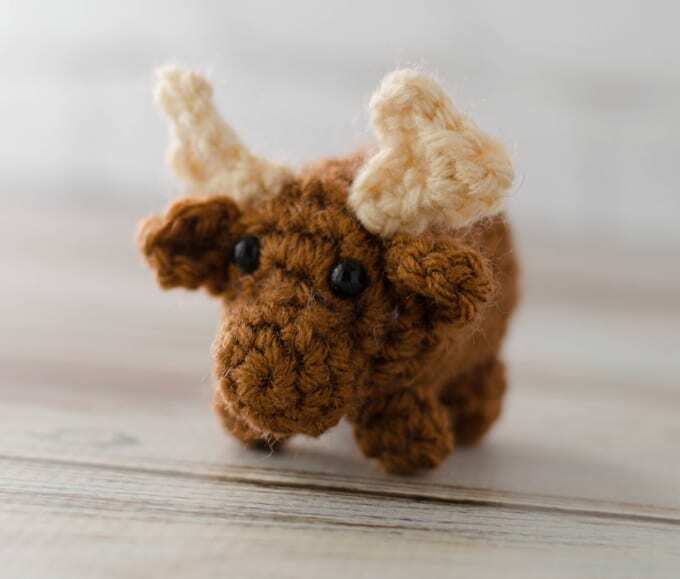 If you would like to share this Crochet Moose #BittyBumble pattern with others, just link to this page. If you’d like to make items for sale from this pattern, please visit my About page for more information. I have a question. How did u make his nose?